The fog at the top of the final climb on yesterday's stage of the Vuelta a Espana was so thick it was almost impossible to make out who was crossing the finish line. But the picture at the end of another fascinating day was clear enough: Britain's Simon Yates now has just three stages to negotiate, two of them mountainous, if he is to win his maiden Grand Tour in Madrid on Sunday. 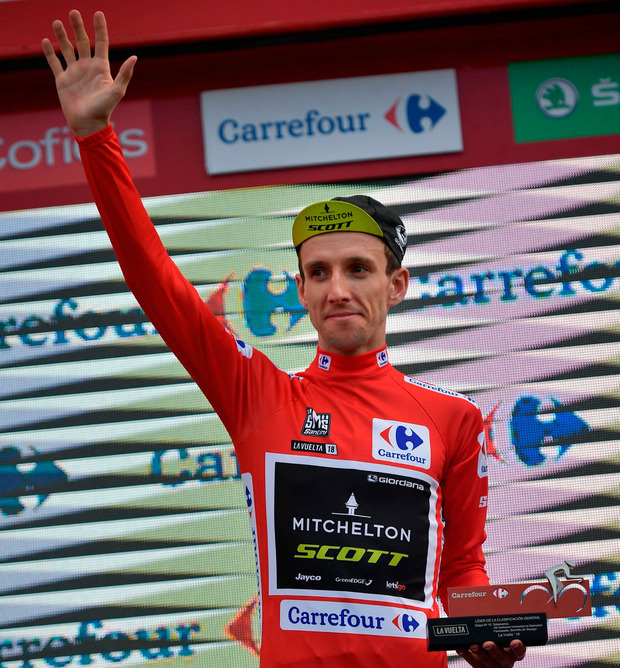 Yates had his advantage over the Spaniard Alejandro Valverde cut to 25 seconds after the Movistar rider got the jump on him at the summit finish above Alto del Balcon de Bizkaia in the Basque Country. But the 26-year-old did well to limit his losses on the day to just eight seconds. A fascinating 17th stage was won by Michael Woods, who emerged strongest from the day's breakaway. The Canadian, who rides for Team EF Education First, beat Belgium's Dylan Teuns and Spain's David de La Cruz after powering away from them in the final 800m of a steep finish, which had ramps of well over 20 per cent. It was a poignant victory for Woods. "My wife and I lost our son," he said. "She had a stillbirth and it was a really tough time. I told her that I wanted to win for him and I did - I can't describe how happy I am right now." John Brennan Ireland’s Sam Bennett finished third in today’s stage of the Tour of Turkey, extending his overall lead to 24 seconds. Gerard Cromwell Sam Bennett sprinted to a second consecutive stage victory at the Tour of Turkey yesterday when he claimed stage two of this year's race on a hilltop finish in Eceabat.